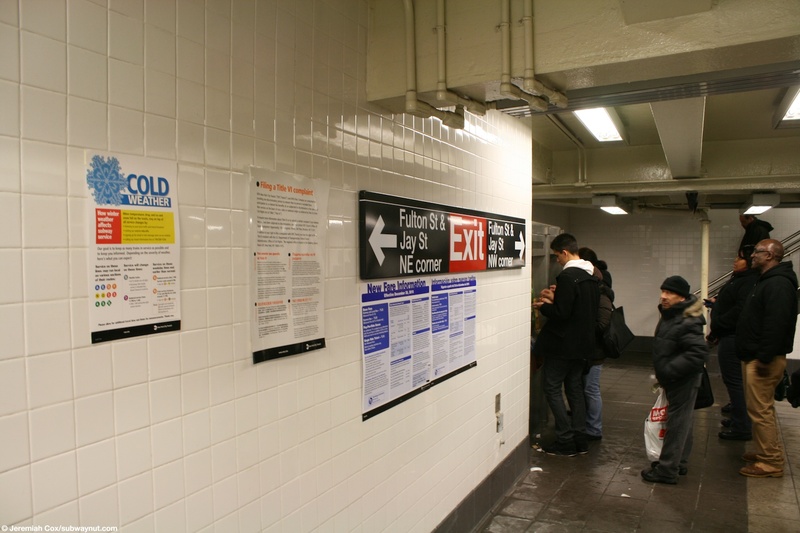 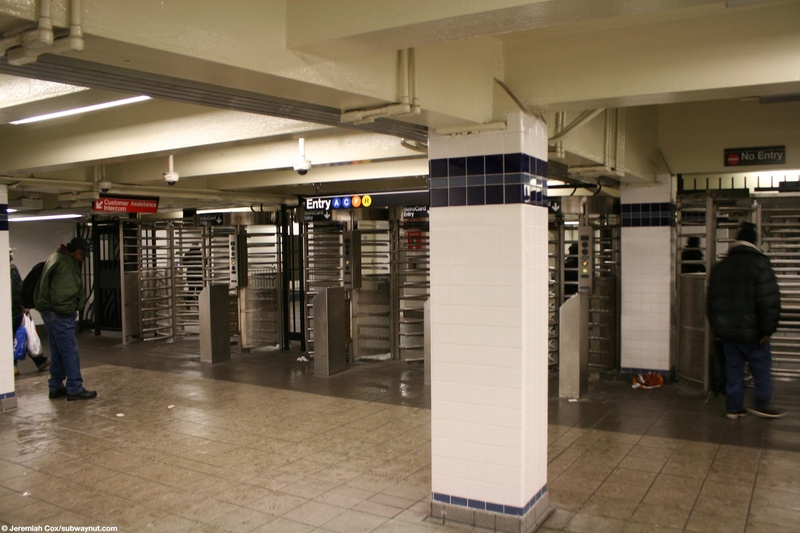 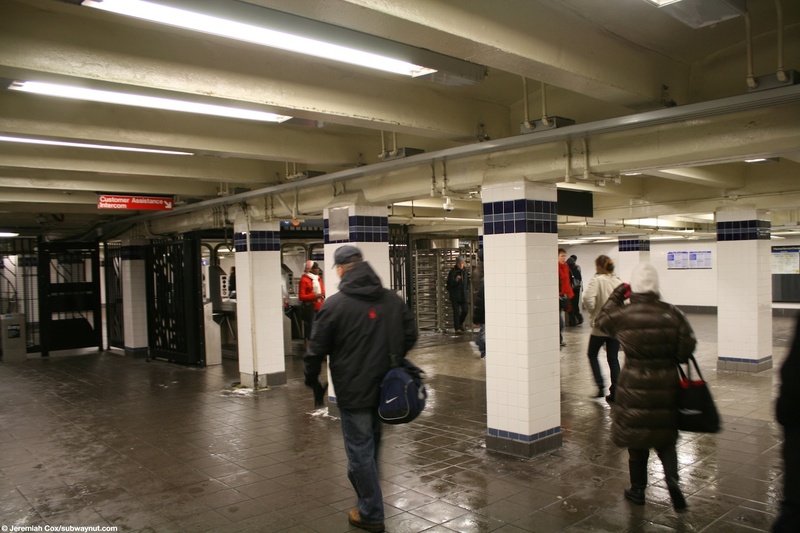 December 2010 Update: Jay Street's renovation has been completed, and the complex is now called Jay Street-MetroTech and the renovated state has chopped the mezzanine in two, the current configuration is a small mezzanine at the northern end of the platforms with two staircases up from each platform that lead to a bank of both unstaffed turnstiles and High Entrance/Exit Turnstiles. 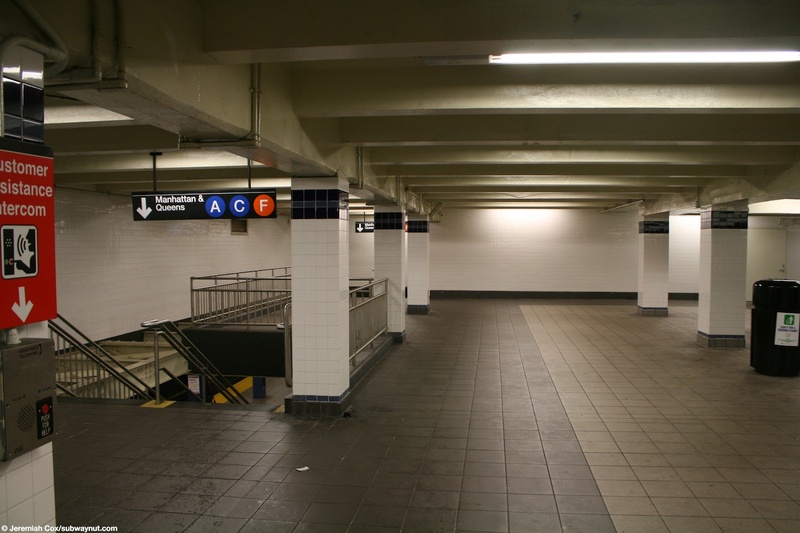 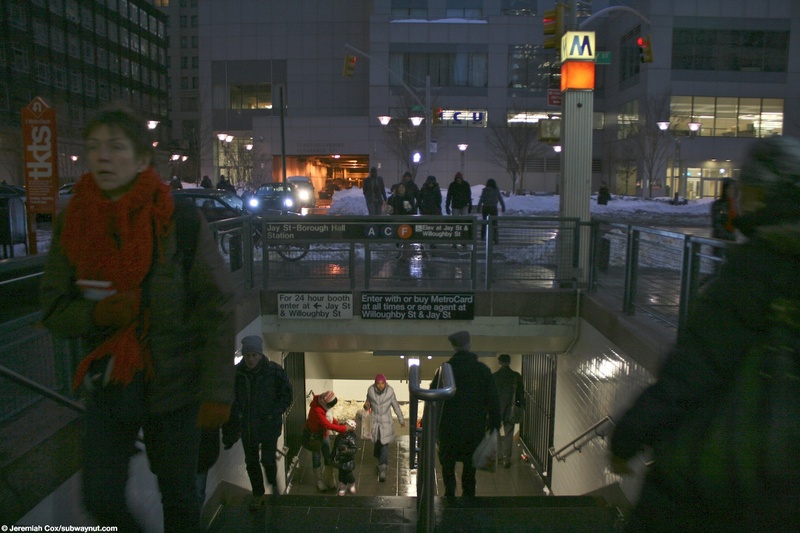 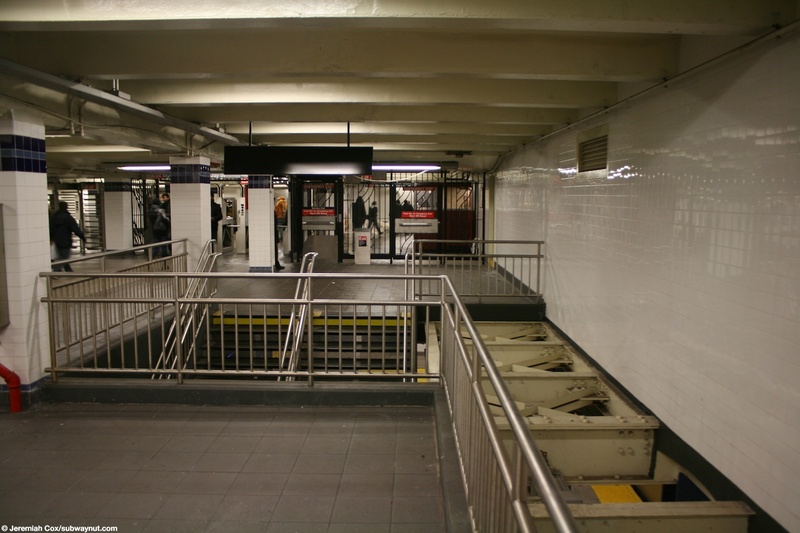 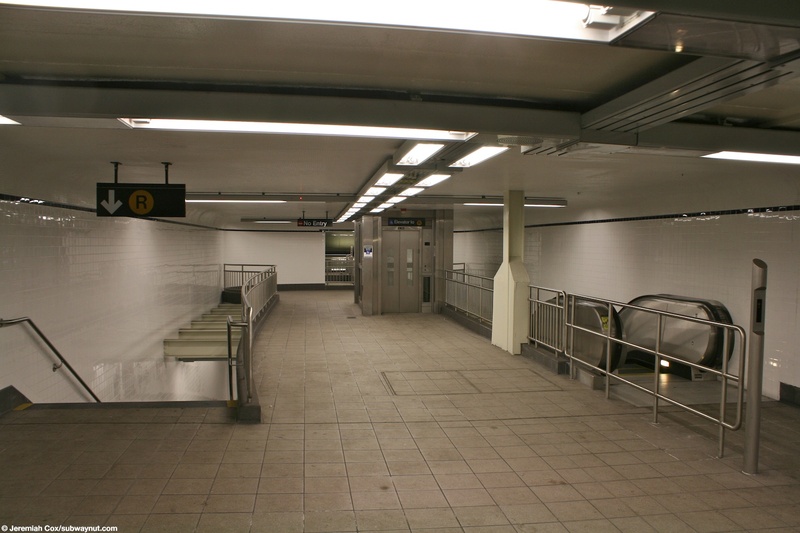 This leads to the escalator exit at the north side of the NYC Transit Builing and a wide staircase that is accessed via a passageway to a wide street stair on the west side of Jay Street at the pedestrian street Myrtle Avenue has become. 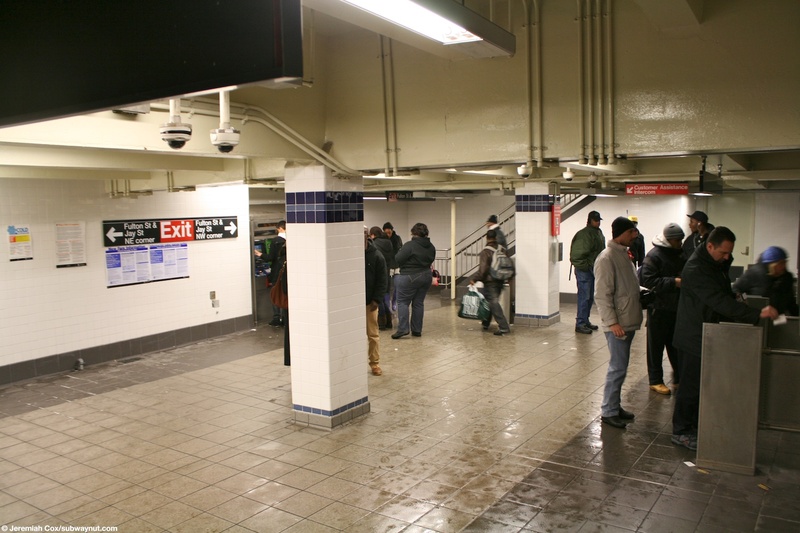 The main mezzanine area starts half-way down the platform and multiple staircases and elevators from each platform lead up to a central area where there is the 24-hour booth and bank of turnstiles that lead to a street elevator and the escalator exit inside the the southern corner of the TA building (the NW corner of Jay and Willoughby Streets) across from it is the new transfer to the R train at its now renamed Lawrence Street Station. 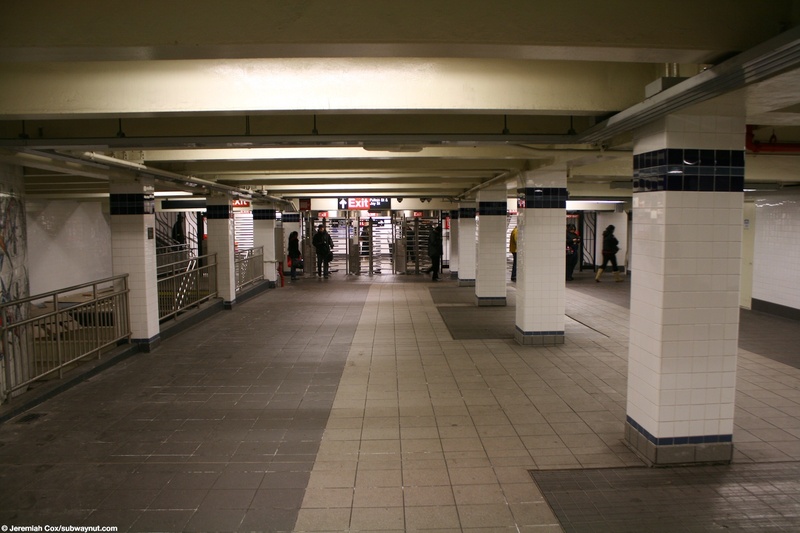 The corridor consists of a down escalator that begins almost on the IND station mezzanine and leads directly to that station's island platform. 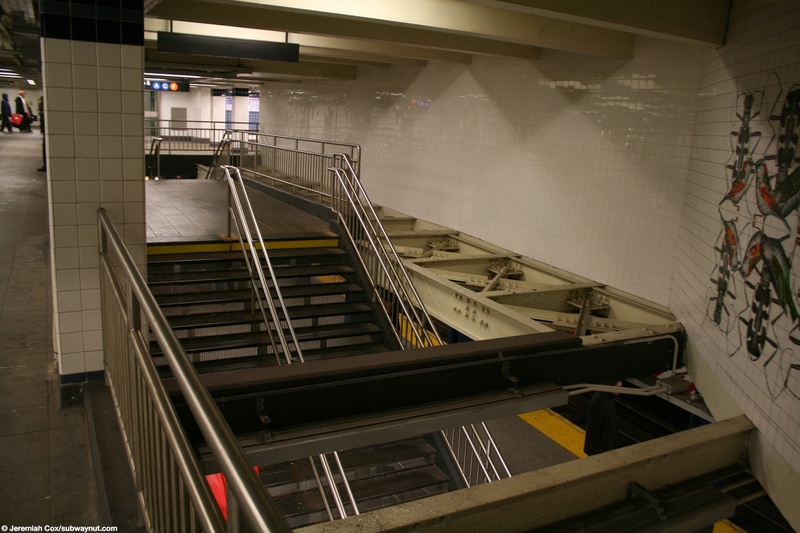 This is followed by an elevator to that platform, a staircase is also available that makes its way down via an intermedate landing (to get aligned on the platform) and finally an up escalator that goes streight to the upper mezzanine of the connector. 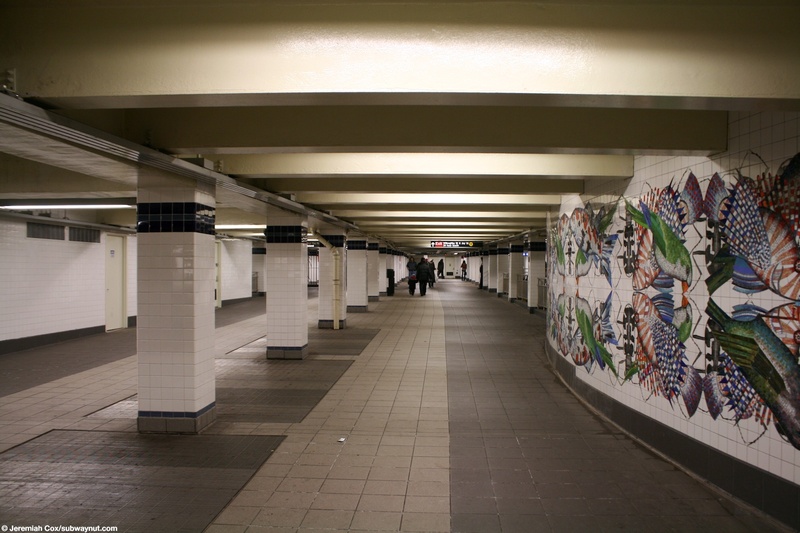 The passageway is so short it almost is non-existent that its amazing a transfer hadn't been built before. 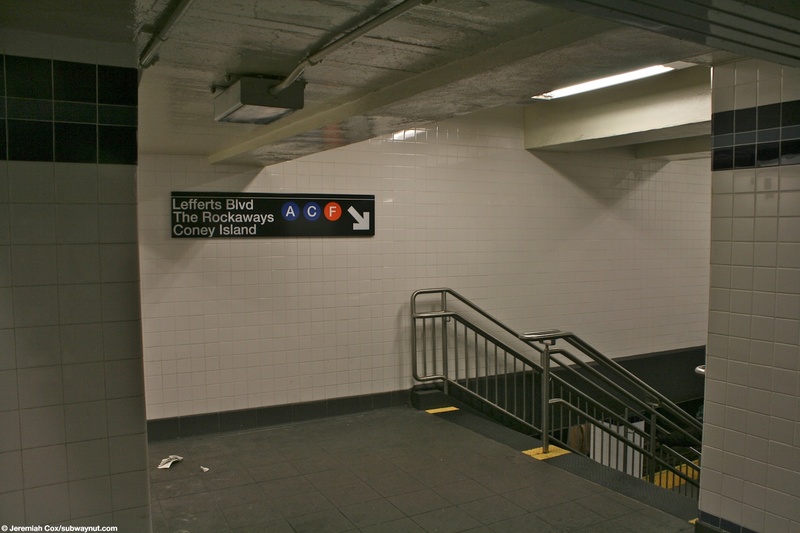 The entrances here rightfully now signed for the R as well, there a convienint way to reach that platform. 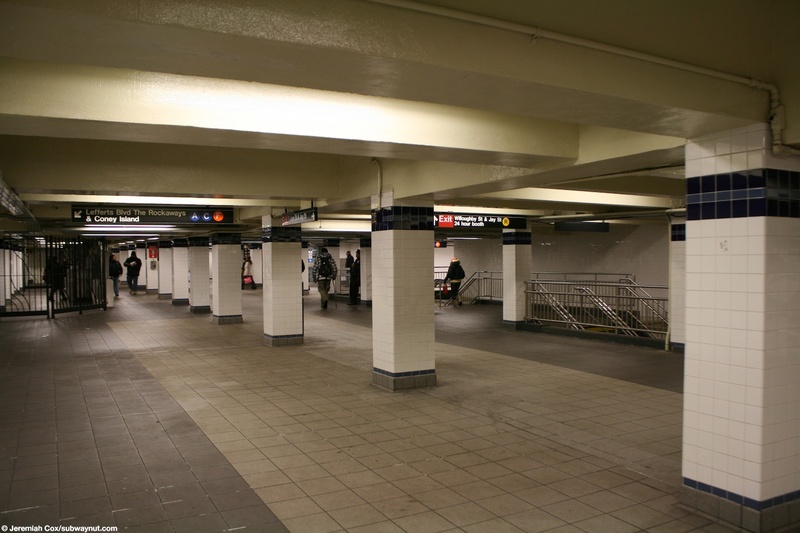 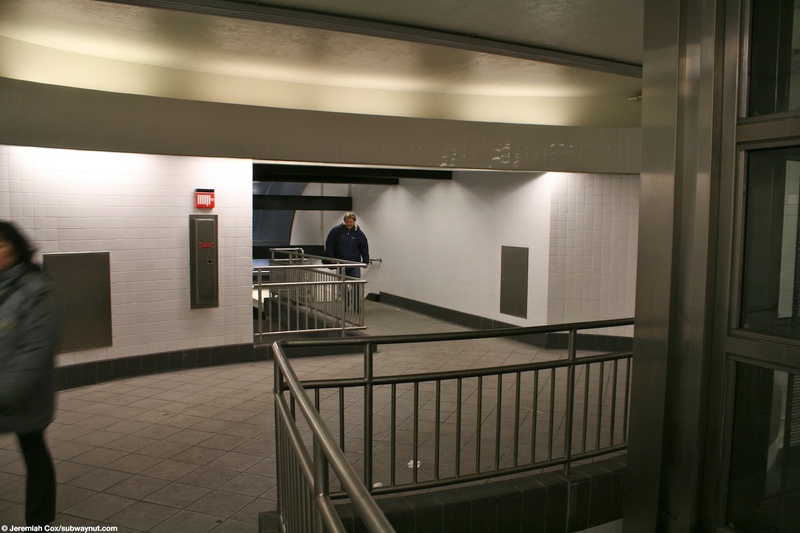 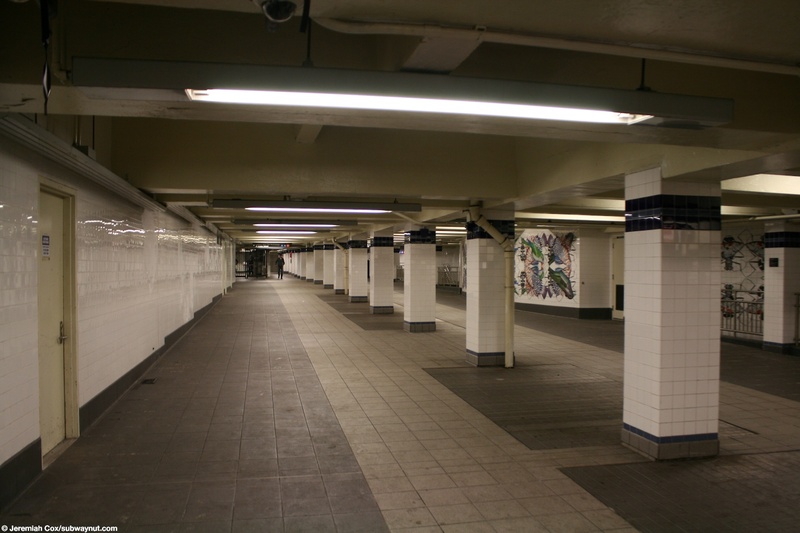 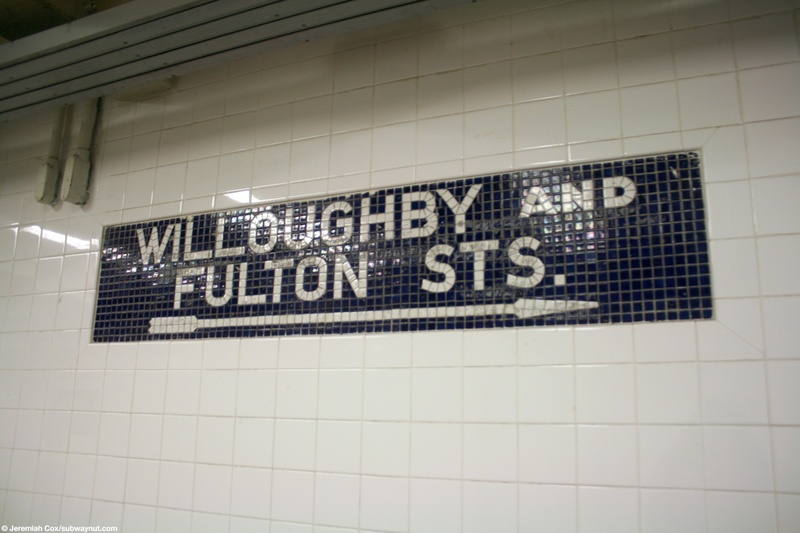 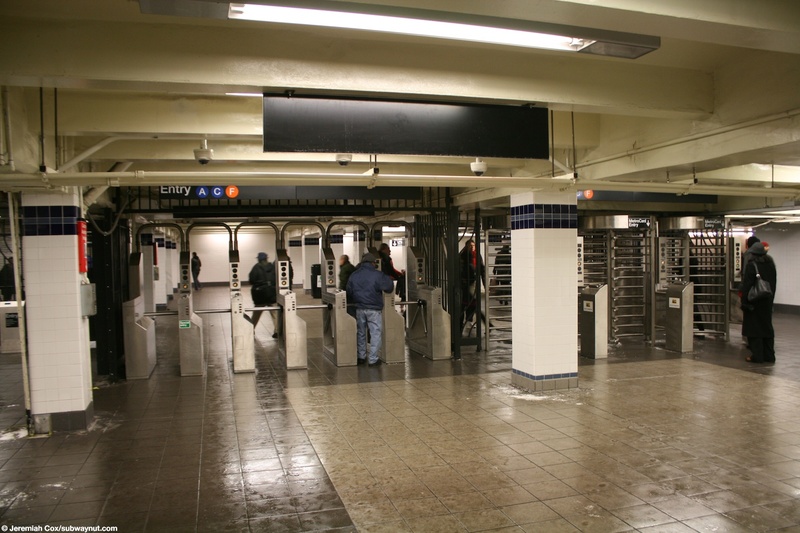 On the south side of the passageway are a pair of High Exit Turnstiles that lead out to two street stairs at the NE corner of Jay and Willoughby Streets. 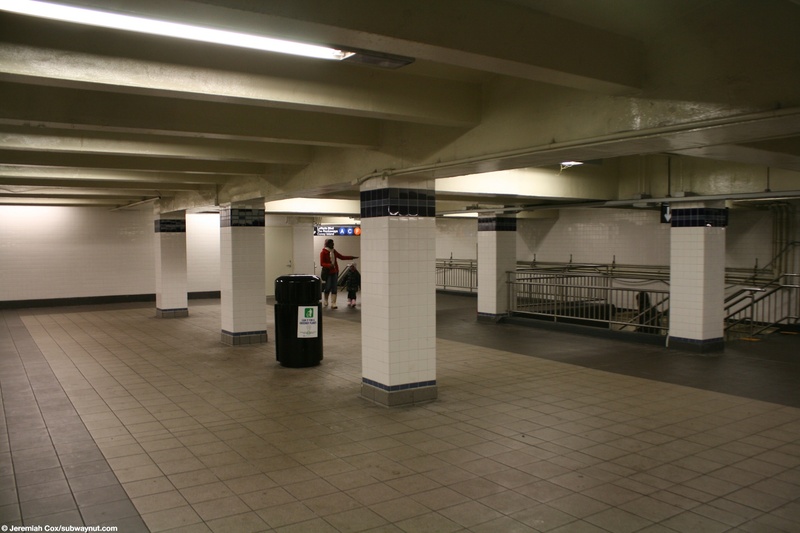 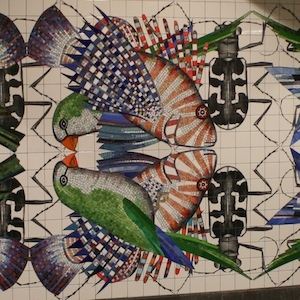 The mezzanine continues for the southern half of the station where the station's artwork is installed curving around providing some views to the platforms, it reaches the southern entrance where a single staircase leads up from each platform to High Exit Turnstiles that lead out to eitherside of Jay Street at the north side of Fulton Street. 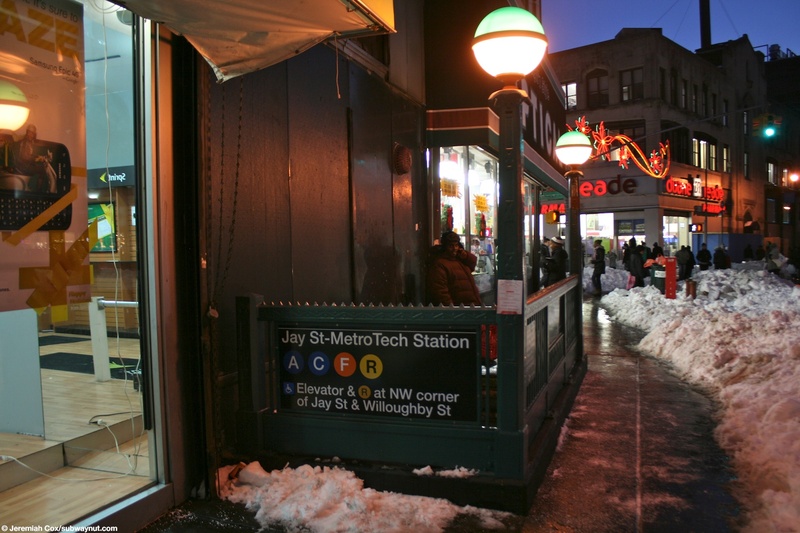 28 December, 2010 (jay_metrotecha7) Which side of Fulton St? 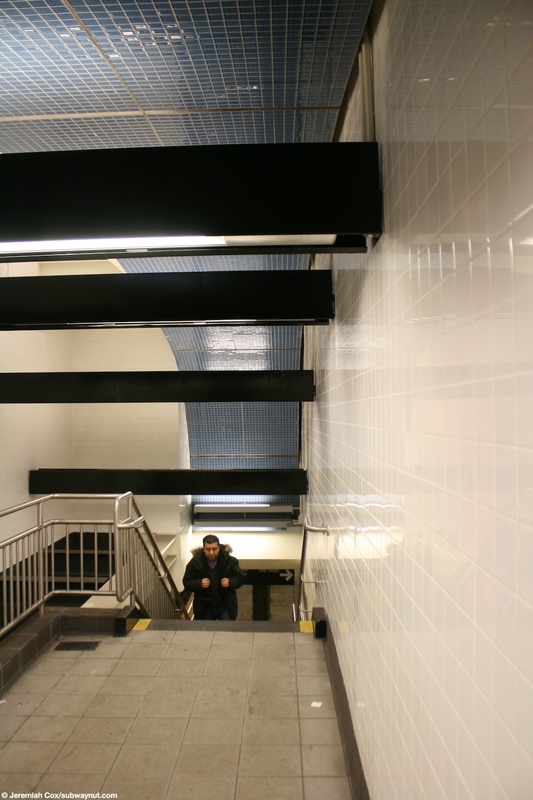 28 December, 2010 (jay_metrotecha14) The new passageway to the R train, escalator stairs, or elevator?